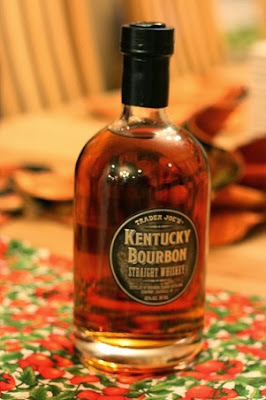 Listen, I'm not going to sit here and type up a review and pretend that I'm any sort of bourbon expert and attempt to give you a technical breakdown of Trader Joe's Kentucky Bourbon. That's just not in my wheelhouse, so if that's what you're looking for, check out a review like this one or this one. My sniffer's too stuffed to try and make up all those aroma descriptors anyways, and all those other terms...yeah, I can take a stab at what they mean, but it's better I don't. But, courtesy of a good buddy of mine who doubled as a housemate back in my bachelor days several moons ago, I've drank enough bourbon to know what I like and to know what I don't. We'd go pick up whatever at the local state store (Pennsylvania's weird) and go thru a bottle every two or three weeks. What I like: good, balanced, strong flavor, with a little burn, and not too oaky. What I don't like: flavored and infused bourbons (like Red Stag when not used as a mixer) or bourbon that's oaky enough to pass off as some type of Ent secretion, or anything that tastes watered down or cheap. Just give me a good couple fingers of bourbon on the rocks, and I'm set. That's almost precisely what TJ's bourbon is. There's nothing fancy or pretentious about it. It's very good, not superbly great, but honest, tasty bourbon. There's a little oak here, some sweetness there, and doesn't taste too medicinal like some of the cheap-o stuff tastes. It's a reasonably darkish amber color that also smells the part - a little sweet, a little boozy, etc. For the most part, it's a smooth, balanced flavor that goes down without too much trouble but does put a tickle in the back of your throat after a lingering finish, which I'll admit made me cough the first time. I'm kinda a wimp in that regard, but it's been a while. The ABV hits a more-than-respectable 45% so it's probably best to enjoy when at home and there's nowhere to go for a good while. The word on the webs says this is distilled by the good folks at Buffalo Trace, which I do remember as a bottle I liked to get back in the day, but not recently enough to do a straight-up comparison of the two. The wife and I picked up the bottle when, on a whim, we hit up the Princeton, NJ shop over the weekend while visiting my folks. I've been to Trader Joe's in nine states (California, Utah, Indiana, Ohio, Pennsylvania, New York, Maine, Massachusetts and now New Jersey) but this was the first time I've stumbled across a TJ's with actual hard liquor and not just beer or wine in it, so we were pretty excited to crack it open with my folks and siblings and their spouses after all the kiddos finally went to bed one night. All of us guys had no problem with enjoying a glass or two on the rocks, while the ladies seemed to enjoy mixing theirs with Dr Pepper more. Good times were had by all. If this were a $25 bottle, I'd be fairly content. If it were $20, I'd be downright pleased. But it's only $15! That makes me want to write my state senator to urge them to rewrite Pennsylvania's antediluvian alcohol bylaws so I could buy it without going on a nearly 700-mile roundtrip. Silly Quaker heritage. The general consensus of my brothers et al averaged about a four, so that's what I call it for them. For me, I just wish it were tad bit more distinctive somehow, but as is, I'm going 4.5. Nicely done, Trader Joe's. Nicely done. It's the only kind I buy! I am not a bourbon connoisseur, even though I do live in Kentucky. I just know that it tastes ok, and that's enough for me. And you just can't beat that price. I wish we could buy liquor at our TJ's in Indy. Or, you know, buy alcohol anywhere on Sunday. Wait, I thought Castleton did sell liquor. Or is it only beer and wine? Is it the same for the one on the west side? glad you liked it. I brought a bottle to a Kentucky Derby party last year where there was a Bourbon tasting after the race and people initially scoffed at it but it got high marks from the unbiased. All TJs in CA I've been in have had hard booze. California may have high taxes, but we do have easy liquor purchasing and can pump our own gas so that almost makes up for it. I highly recommend the $10 liter of Whaler's Rum, a staple of TJs for years and the price has remained the same for 10 years. Great for the smoothie blender for tropical drinks. And don't get me started on the $10 Zapopan tequila, available in blanco and reposado, also 1L and 100% agave. Thanks for those recommendations! May have to pick some of those up next chance I have (which unfortunately won't be for a while). The ones in Indiana have hard liquor now. No alcohol at TJ's in Pennsylvania? Jeez, Louise. Would highly recommend TJ's Simply Lager - 3.99 for a 6-pack here in Vegas, higher alcohol content than the Buds and Millers, brewed in Wisconsin. And I'm not into beer, but this stuff is delish. We stayed there for a few hours and enjoyed the music. Very different from the vibe and music of Vegas. Super cool vibe and sound proof on the roof.